Final technical report shows an increase of 6,049 ounces in the Indicated category and 183 ounces in the Inferred category, which totals 1,752,100 tonnes at 1.85 g/t Au for 104,100 ounces of gold in the Indicated category and 74,000 tonnes at 2.96 g/t Au for 7,100 ounces in the Inferred category. 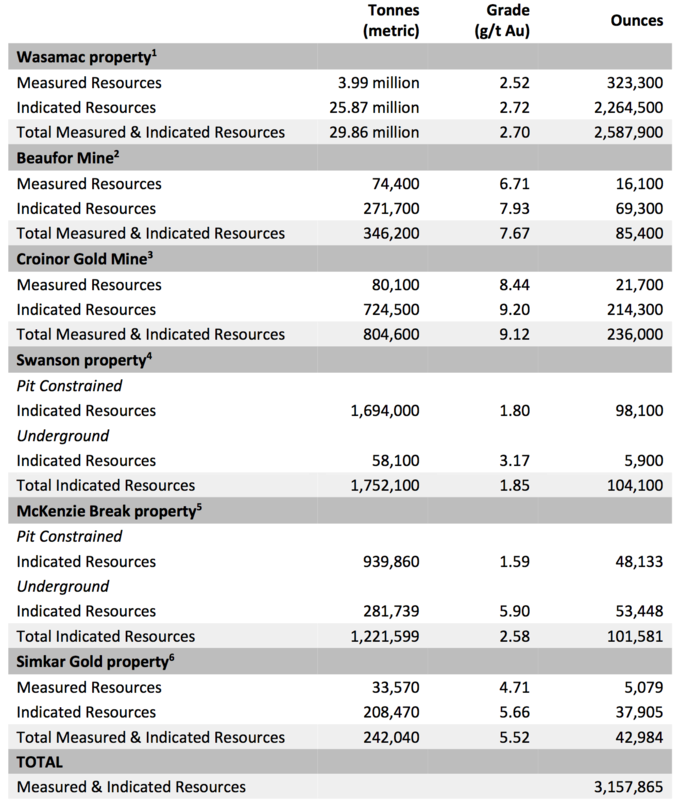 Monarques Gold combined Measured and Indicated resources now stand at over 3.15 million ounces of gold (see table 1 at the end of press release). Montreal, Quebec, Canada, August 3, 2018 – MONARQUES GOLD CORPORATION (“Monarques” or the “Corporation”) (TSX-V:MQR) (OTCMKTS:MRQRF) (FRANKFURT:MR7) is pleased to announce that it has filed on SEDAR a National Instrument 43-101 technical report for its Swanson gold project. Monarques published a press release on June 20, 2018 (see press release). Following the process of writing the technical report and validation, the following changes were made to the resource table (see Table 1): an increase of 6,049 ounces in the Indicated category and 183 ounces in the Inferred category. The report is also available on Monarques’ website (see technical report). The estimation encompasses four zones with a minimum true thickness of 2.5 m using the grade of the adjacent material when assayed or a value of zero when not assayed. High-grade capping of 30 g/t Au (4 g/t Au for the dilution envelope) was applied to assay grades prior to compositing grade for interpolation using an Ordinary Kriging interpolation method based on 1.5 m composite and block size of 3 m x 3 m x 3 m, with bulk density values applied by lithology (g/cm3): I2 = 2.78; I4O, V3, V4 = 2.90, and OVB = 1.5. The technical and scientific content of this press release has been reviewed and approved by Marc-André Lavergne, Eng., the Corporation’s qualified person and by Christine Beausoleil, P.Geo. and Alain Carrier, P.Geo., M.Sc. of InnovExplo Inc., all of whom are qualified persons as defined by NI 43-101..